Traditional spoon-shaped net with black micromesh sides and a 6 mm base mesh, both rubber coated for quick drying and smell prevention. 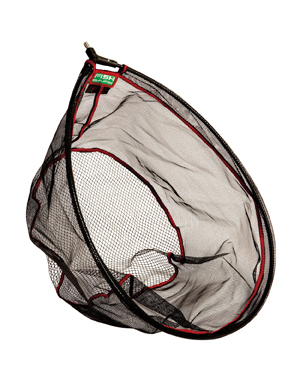 It would be possible to get carp up to 20 lb into this surprisingly roomy net, which has a sturdy frame and spreader block. It is also shallow enough to be able to unhook fish in before releasing them back in the water. One dislike was the mesh format, as large mesh sides and a micromesh base would work better for manoeuvrability. 6 mm polyester mesh throughout. The rubber mesh resists water and is less prone to snagging hooks and spiky dorsal fins on small carp. This smart-looking, all-black net has a robust over-fitting aluminium frame that protects the rim of its mesh against damage. Comfortably accepts carp close to the 20 lb mark and is surprisingly lightweight. Rather deep, making it tricky to unhook fish within its confines. 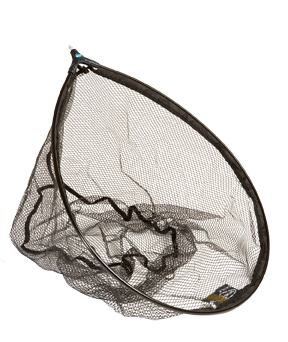 Shallow, latex ‘D’ shaped net designed specifically for match carping. 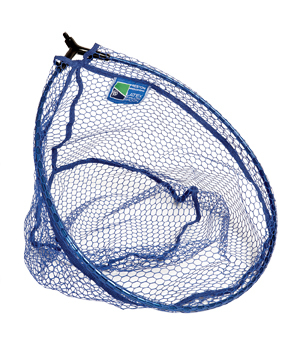 This has large, blue free-flow mesh throughout for fast manoeuvrability in water, and is just the right depth for unhooking contents quickly. The alloy frame is also ‘D’ shaped for extra strength, combined with a tough, businesslike spreader block. Should handle bonus fish to 14 lb comfortably, and is geared up for speed fishing with smaller samples. However, the big mesh means rigs can fall through and snag. 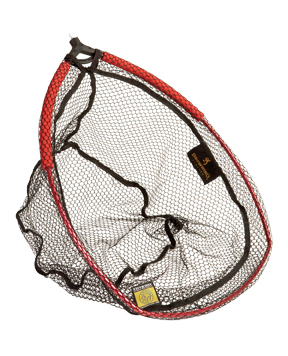 This smaller landing net is lighter and easier to manoeuvre than others, especially when wet. Three-quarters of the sturdy ‘D’ section alloy frame is spoon shaped, while the leading rim is slightly squared off to aid speed scooping smaller fish. 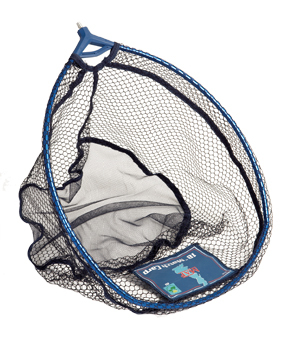 This distinctive, blue polyester net has a cradling micromesh base and larger ‘free flow’ side meshing. Its sturdy spreader block is above average, too. Looks perfect for landing match-sized carp well into double-figures, and there’s also a 24 in. version for real lunkers. Another 18 in. 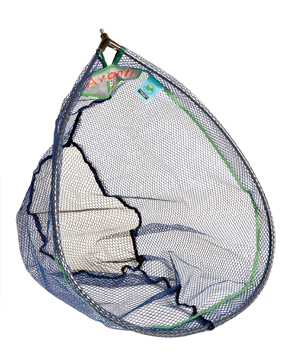 net that is mainly spoon shaped, but with a squared-off front lip for fast scooping work, along with a sturdy spreader block identical to the MAP product. This design differs in that it has black, free-flow mesh throughout, and the ‘D’ section alloy frame has foam buoyancy tubing either side of its spreader block. The latter keeps the net floating when you are waiting to net a fish, which takes some strain off your arm. Big mesh is less resistant in water, but rigs can drop through it and snag. This lightweight design should handle carp well into double-figures easily and be easy to manoeuvre quickly. Features 6 mm rubberised blue mesh throughout and a spoon-shaped frame, with a slightly flattened leading edge for easy scooping when speed fishing. The base is fish shaped, which helps cradle carp better when unhooking them, and the depth is just right to do this within the confines of the net. Finished with a neat spreader block, and the ‘D’ section aluminium frame is very sturdy.